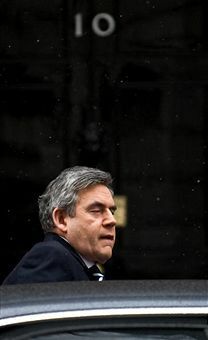 After the hubbub about Hewitt ‘n’ Hoon’s plot to unseat Gordon Brown, PMQs is perhaps a distant memory. It’s certainly made my review a little later than usual. But better late than never, as today’s clash was a bloody and intriguing contest with both party leaders on combative form. Cameron seemed unusually relaxed, glib and self-confident. Perhaps he’d been tipped off about the plot. Or perhaps he’d been thrilled by the sight of his beautifully groomed coiffure in the bathroom mirror this morning. If he spent as much time on his manifesto as he did on his hair there’d be no talk of a hung parliament. But this didn’t seem to bother him today and he laid happily into the Prime Minister over the budget deficit. Thus began the Battle of the School Reports. Cameron quoted the Governor of the Bank of England who suggested that the government had ‘no credible plan’ to deal with the debt. Brown retaliated with a different report from the boss of the IMF who has awarded him top marks and a gold star for his dazzling stewardship of the economy. The leaders then turned to the interpretation of a decimal point. Brown claims public spending will rise by 0.8 percent. Cheating, says Cameron, since the Brown figure excludes cuts to capital investment. He can’t actually say ‘cheating’ in the chamber but he did manage ‘disingenuous,’ which is nearly the same. Cameron came back with a prepared gag about Brown’s fickleness towards his chancellor. ‘The difference between us is this,’ said Cameron. ‘When I lean across and say, “I love you, darling.” I really mean it.’ The Tories roared, Cameron grinned, and even the flanks of his Brylcreemed hair glowed a little more brightly in the reflected glory of a quip which – let’s face it – has taken the entire Conservative campaign team no less than 36 hours to compose. Brown ended the session strongly and quoted Cameron’s response to a recent question about educational allowances. Asked if he was committed to them or not, Cameron blustered, ‘Let’s say I’m not uncommitted.’ That made him sound dreadfully silly. Everyone in the house was laughing at him and an emboldened Brown predicted that his policies and his approach were fit only for opposition. That came across effectively not least because Brown clearly believed it. So did Labour. Nick Clegg had a muted outing today. He harassed the PM over a tax system which deprives cleaners of a higher proportion of their income than the bankers whose carpets they toil away at in the wee small hours. Unfair, huffed Clegg. Ah yes, said Brown, and that’s why I invented the intricate beauty of the tax credit system to compensate them. Tax credits, as we all know, are a government scheme that helps low-paid workers have fun filling out forms instead of wasting their leisure time enjoying themselves. Michael Spicer asked a brief and potentially deadly question. ‘Now we face stagflation what’s he going to do about it?’ Brown held his nerve and dismissed the idea that low growth would cause the economy problems. And he had more fun with Ann Winterton, who asked him to ‘re-consider the wasteful expenditure of £100bn on wind-farms.’ Even those who question global warming must know that election time is not the moment to hand cheap ammunition to the enemy. Mrs Winterton’s question gave Gordon an easy chance to paint the Tories as a bunch of climate change deniers and to laugh at their lack of a coherent energy policy. Labour laughed along with him. What a paradoxical session. Brown fared unexpectedly well today but walked from the chamber and straight into a new man-trap set by his own side. Is this the unluckiest PM in history?